If you send money overseas to family or friends, you know the fees can add up quickly! CIBC offers $0 transfer fees on Global Money Transfers to more than 60 countries, including India, the Philippines, China and the US. 1 If you have a CIBC personal bank account (savings, chequing or a personal line of credit) but have not yet tried CIBC Global Money Transfer ("GMT"), request a GMT transfer and you will receive $30 CAD in your CIBC account within 20 business days. Offer runs from 12:00:01 am EST on January 15, 2019 until 11:59:59 pm EST on February 28, 2020. Use promo code GMTSAVINGS to take part in this deal. 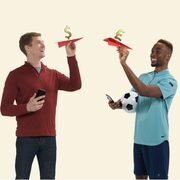 2 Open a new CIBC personal bank account (savings, chequing or a personal line of credit) and make a CIBC Global Money Transfer within 60 days after account opening and you will receive $60 CAD in your new account within 20 business days. Offer runs from 12:00:01 am EST on January 15, 2019until 11:59:59 pm EST on February 28, 2020. Use promo code GMTSAVINGS to take part in this deal. 3 Referrals must be made to first-time users of CIBC Global Money Transfer in order to qualify for credits.